The song was written as an experiment with sound effects. I thought it would be interesting to choose sound effects in Garage Band and seeing if I could write a song around them. Seeing as I don’t have lyrics in my songs I try to develop a story though the sound. So incorporating sound effects seemed a way to do this. This song is about what happens when you don’t service your UFO often enough. Just hope a fellow traveller is going past and has jumper leads. Would you like to be stuck in space with a broken down UFO? Listen to the song on MacJams here. 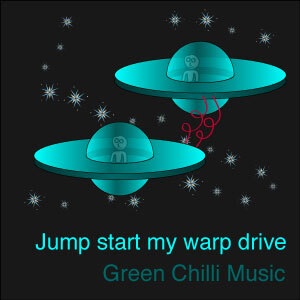 This entry was posted in Music and tagged Green Chilli Music, MacJams, Music, space, UFO. Bookmark the permalink.